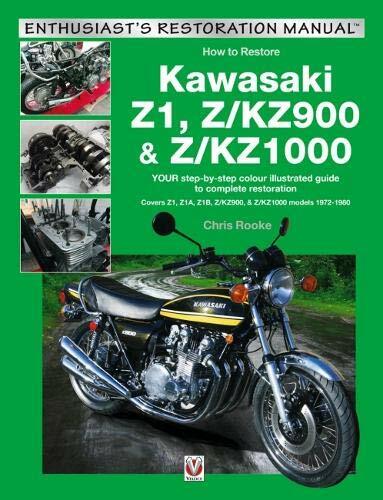 Kawasaki Z1, Z/KZ900 & Z/KZ1000 is for all owners and enthusiasts of the legendary Kawasaki Z1 900, Z/KZ900 and Z1000 built between 1972 and 1980. The book covers the complete restoration of a 1976 KZ900, from the sourcing of the bike to its completion as a fully restored machine. Every area is covered starting with advice on the different models, spares availability, and where best to source a bike to restore. Every area of the restoration is then covered in full detail including the engine, frame, gearbox, wheels, suspension and forks, brakes, ancillaries, bodywork and electrics, accompanied by hundreds of clear color photos to illustrate the text. Additional work on a 1974 Z1A model adds complementary information. What really sets this manual apart, however, is the style in which it is written: not as some dull and distant workshop manual but in a friendly, humorous manner by an enthusiast of many years who is able to involve and entertain the reader, as well as guiding them through the restoration process. This is the third restoration guide from Chris Rooke, whose previous works have been a massive hit with mechanics, enthusiasts and restorers throughout the world.